SHORTLISTED FOR THE ORWELL PRIZE 2017 'The best political book of the year' Andrew Marr 'A superb work of storytelling and reporting. 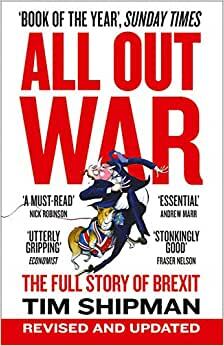 Sets new benchmark for the writing of contemporary political history' Andrew Sparrow, Guardian The only book to tell the full story of how and why Britain voted to leave the EU. Start reading All Out War on your Kindle in under a minute. Tim Shipman has been a national newspaper journalist for sixteen years and has a wealth of experience reporting on British and American politics and international relations. Currently the Political Editor of the Sunday Times, Tim has covered four British General Elections and three American elections from the US. Well known in the Westminster political mix, he is a trusted confidant of politicians from all political parties and has a growing following as a witty observer of the political scene @ShippersUnbound. Tim Shipman's book is an intense journalistic focus on the politics leading up to and about Brexit (from mid 2015 through Sept 2016). The book is long (600 + pages) and it could have been edited effectively without losing its color and analytical depth. Its vivid, even-handed portraits of the players (Boris Johnson, Michael Grove, Jeremy Corbyn, David Cameron and Theresa May, Dominic Cummings) are enlightening, the "Remain" and the "Leave" landscape and strategy are fairly presented, its June 2016 outcome is dramatic (even though known) and its finale is a Shakespearian political scramble within the Tories leading up to the election of Theresa May as party leader. Shipman reserves his well thought out opinions for his thirty (30) page conclusion. The beginning includes an informative timeline and he adds Johnson's "In" Article and Cameron's "Victory" speech. Fascinating look at the actors, the plans and the gaffes that led to Brexit. Shipman interviewed extensively and provides an almost day-by-day in progress review of the run-up to Brexit. The players on display are shown at their brilliant best and their lewd, bumbling worst. A must-read for political junkies, those trying to make sense of internationalism in retreat, and those curious about the parallels between Brexit and Trumpism. One of the best books I've ever read, and, as a political work, in the league with Cramer's masterpiece "What it Takes" (the greatest book ever written on politics) and Caro's Lyndon Johnson series. I've been following British politics since the 1990's and intensely since the 2000's. But I wondered whether 688 pages on the Brexit referendum was more than I needed. On the contrary, Shipman provides all the necessary context of Britain's long and tumultuous relationship with the European Union without lingering or engaging in tedium. What follows is a gifted storyteller mining an epic drama for all of its narrative worth. Imagine a national referendum over the future of the country with fissures running through party lines and pitting leaders of the two major parties against one another. Underlying this national battle is the psychodrama among a group of friends who attended Oxford in the 80's: Boris Johnson, who watched as his younger classmate David Cameron ascended to the leadership of the Conservative Party and the premiership ahead of him, who emerges as the front man of the Leave campaign, putting him on the path to being prime minister; Michael Gove, whose modest background affected the dynamic with his classmates Cameron and Johnson, found himself marginalized in the latter's government. Gove, who supplied much of the intellectual heft of the new Conservatives, would do the same for the Leave campaign. The interpersonal politics and personal history was just as interesting as the campaign itself, which cannot be understood without it. Shakespeare wouldn't have dared to invent this story. Cameron, the young prince, never a Europhile, promises a referendum in order to win a General Election in 2015. The referendum fails, and his political career with it. In the retrospect of his amazing career, Europe was always there, waiting, to give him his greatest victory but also his final and fatal defeat. How Leave wins, and the head Brexiteers lose the peace, is a story that deserved a book of this magnitude. I enthusiastically recommend it. Fascinating instant - history of the Brexit campaigns and immediate aftermath. Even this yank across the pond could not put it down once I started reading - even knowing how it ends!